The lack of posts on here is due to the fact that I had to travel to the east coast for work (but I did update my flickr account). I wanted to make something special for Angela for Sunday dinner but instead I ended up making something that I wanted to (oops). This recipe appealed to me immediately upon reading it. Combining pork and pasta, two of my favorite foods, it was like it was written for me. I had initially hoped to remember to make the recipe sometime in the future when baked things would be desirable but the weather has cooperated and it’s been cool the past several days (or at least since I got back). This is not something to make on a weekday. In fact, it’s not something to make on an average weekend. It takes a considerable amount of time and effort. And, me being me, I had to find a way to make it more difficult. Replacing canned tomatoes with fresh isn’t that much effort when the tomatoes are readily available but replacing store bought orecchiette with homemade is a bit more serious investment in time and effort. Which was really unintentional but the only orecchiette I could find were $6 for half a pound which is more than I was willing to pay. And I’m not going to figure out exactly what my hourly rate is making homemade orecchiette. But, luckily for all that effort, this is good. It’s very good. It’s good enough that I’m looking forward to eating leftovers for lunch tomorrow (and that’s rare for me even with the best leftovers). Angela thought it tasted a bit like pot roast (but with pork obviously). It reminded me a bit of carnitas with pasta. The pork and pasta marry well together. The red pepper flakes give just enough heat. It is very well balanced. It’s also unlike any other baked pasta dish I’ve had. Most baked pasta is relatively heavy of cheese and sauce. The cheese is almost an after thought with this recipe. The sauce is just the cooking liquid from the braise. It’s as light as most baked pasta is heavy. It’s pleasant simply remembering dinner. And, luckily for me, Angela wasn’t upset that I picked this so I don’t have to sleep on the couch tonight. Dry the pork on paper towels thoroughly, then season with salt and pepper. Place the olive oil in a large dutch oven and heat over medium-high heat until just before smoking. Brown the pork in the olive oil on all sides, about 12 minutes. 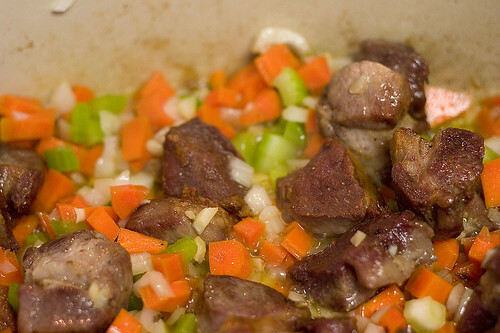 Add the carrots, celery, onion, and garlic and cook until softened, about 8 minutes. Add the tomatoes and the juices and bring to a simmer. Deglaze the dutch oven with the red wine and add the thyme. Boil the red wine until it is reduced by half, about 5 minutes. Add the stock, season to taste with salt, and bring to a boil. Cover and simmer for 2 hours. Using a slotted spoon, transfer the meat and vegetables to a food processor, discarding the sprigs of thyme. Pulse the food processor several times until the pork is shredded. Return the pork and vegetables to the dutch oven. Stir the parsley, oregano, and red pepper into the dutch oven. Season to taste with salt and pepper. 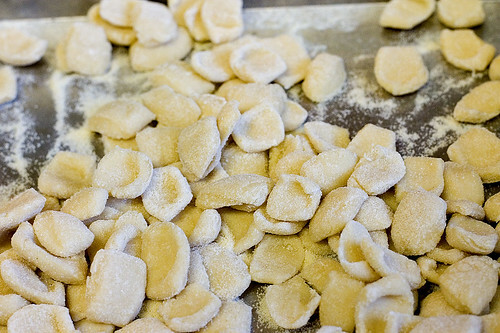 Cook the orecchiette in boiling, salted water until they float. Drain the orecchiete and stir into the dutch oven. Place the pork-pasta mixture in a large baking dish. Sprinkle the cheese on top of the mixture evenly. Remove from the oven, allow to rest for 15 minutes, then serve immediately. In a bowl, mix together the two flours (don’t do this on a work surface, I tried and the water runs all over the place). Make a well in the center of the flour and add the water and salt. Using a fork, slowly incorporate the water into the flour. Once the flour and water are mostly incorporated, pour the bowl contents onto a work surface. Knead the dough until it comes together and then need for several minutes more. Cut the dough into 8 even pieces. For each piece of dough, roll it into a cylinder with a 1/2″ diameter. Cut the cylinder into pieces 1/2″ wide. Toss the various pieces with semolina flour then place it in the palm of your hand and press down on it with the thumb of your other hand and twist slightly. 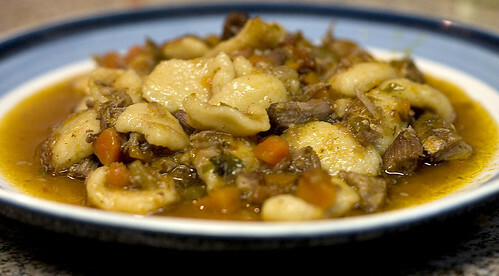 Place the orecchietta on a baking sheet dusted with semolina. Wow, I’m very impressed with the homemade pasta AND pork sugo. I cut this recipe out of the magazine, am definitely planning on making it now! Thanks for the orecchiette recipe! I just bought some semolina flour and can’t wait to give it a go. I’ve never made pasta before, but think this is the ideal foray 🙂 Nice blog!